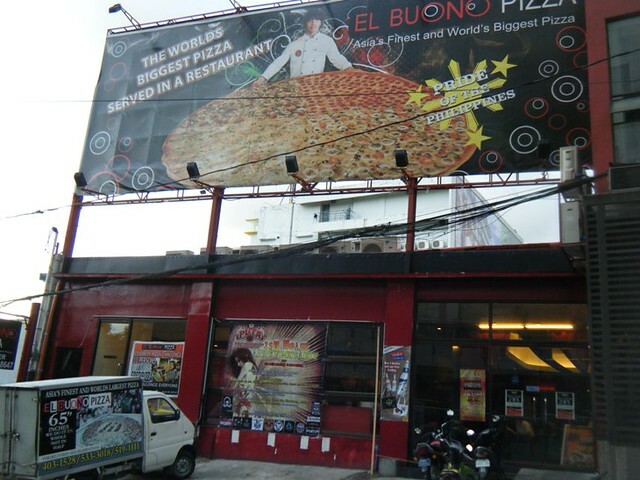 If you love pizza and eating large servings of it, you would definitely love it at El Buono in Tomas Morato. 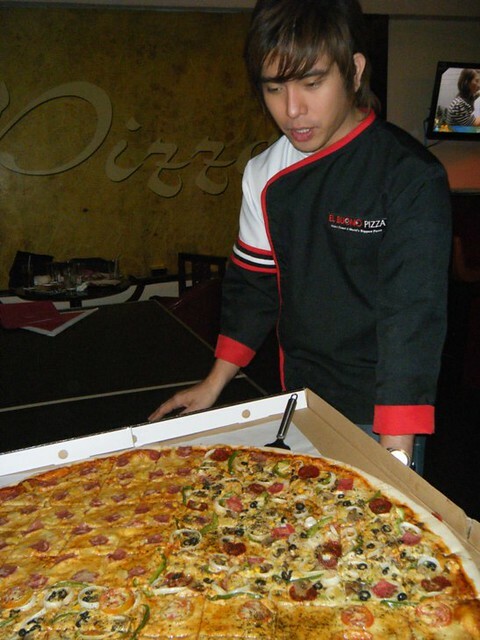 They claim to have Asia’s biggest deliverable pizza, a gigantic 65-inch creation that can feed 150 people or more, and while they haven’t been recognized by the Guinness World of Records yet, it’s indeed a very impressive feat. El Buono Pizza’s Lance Servida. 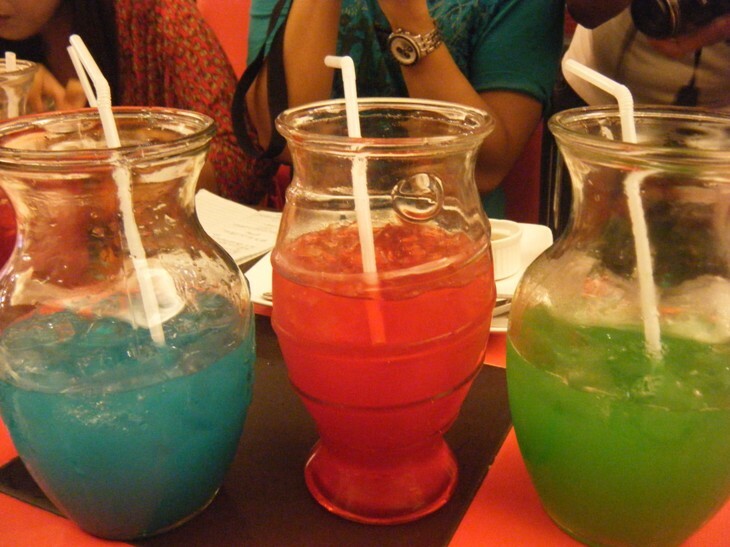 El Buono’s bottomless flower vase iced tea in different colors. El Buono’s quest for the biggest and the largest doesn’t end there; they have also supersized other items, like their Skyscraper burger (two feet long! 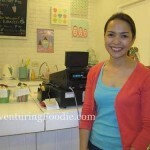 ), the huge and bottomless flower vase iced tea, and a giant dessert that should be more than enough to feed 20 people. These servings, of course, are not for solo consumption, and they do serve other dishes in smaller servings, but El Buono is definitely known for their signature dish. 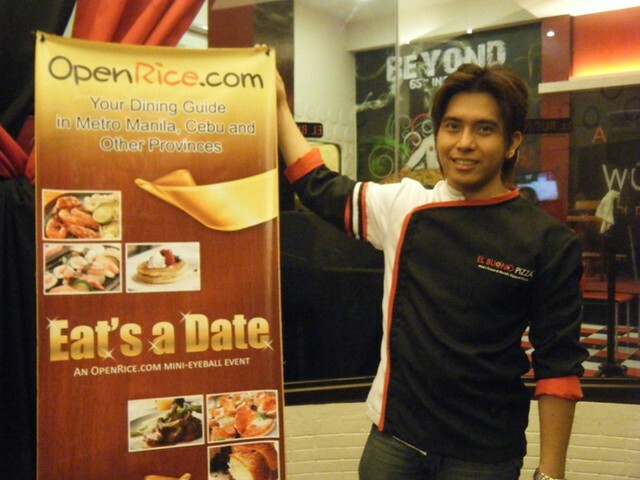 In the recent Open Rice Eats a Date event, I was invited together with other bloggers to experience firsthand what it was like to eat at El Buono. The centrally located El Buono Pizza. I found the location of their restaurant very convenient. 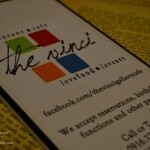 Located just along Tomas Morato, it is easily accessible via public transport or a taxicab. There weren’t too many customers inside, but as our dinner progressed, we could see customers slowly come in by groups. For indeed, El Buono is not for solo eaters. You would need to share your orders with friends! According to Lance Sarvida, the 27-year-old co-owner, product developer, singer, and the face of El Buono, they started with a small pizza chain four years ago in Mandaluyong. A Fine Arts student, he was very interested in making pizzas, and while he was not a professional chef, he more than made up for it with his voracious quest for knowledge. He actually learned how to make pizza through online research, although he also credits some of his friends who taught him the finer points in pizza making. El Buono’s Lance Servida talking about the 36-in pizza. Pretty soon after they opened, El Buono began marketing the 36-inch pizza, which, at that time, nobody else in the business was making. It became a hit with customers, and soon, their competitors started making them too. Lance then planned on making a bigger one; he initially wanted an 80-inch pizza but settled for a 65-inch due to logistical concerns. 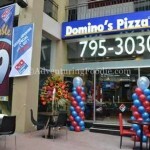 At that time, the biggest deliverable pizza was in the US at 60 inches. How big is 65 inches? It’s around 600 slices, and it can feed 150 to 200 people. While other pizzerias make it by splitting the dough and combining them later, Lance is proud to say they cook it whole, having managed to design and implement an oven specially made for that huge pizza alone. “I experimented for more than a month,” Lance said, pointing out that hundreds of kilos of dough were wasted during the process. The end result is more than worth it though. Costing P7,995, it can either be delivered or served inside their restaurant, perfect for those kiddie parties or birthday blowouts. One slice of the delicious El Buono Special. During the Open Rice event, we only ordered the 36-in (P1,988), and although there were more than ten of us, we had difficulty finishing all of it. We had four different toppings: El Buono Special (meat, vegetables, lots of cheese), Hawaiian, Margherita, andVerdure (vegetarian). My favorites were the Margherita and Verdure, but any topping will do when you eat at El Buono. Their pizza crust is thin and chewy, and they are very generous when it comes to the toppings and the cheese. 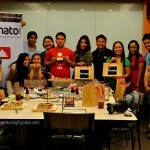 We were also served chicken and pasta (P155, with iced tea! ), and although I could have sworn I couldn’t eat another bite after all the pizza slices I consumed, I did manage to finish all of it. So do I recommend El Buono Pizza? Definitely! I would not want to eat there every day (all that supersized serving is not good for your health! ), but it’s the perfect place to take the whole family for special occasions, or merely for getting together with the gang. Aside from the fact that they have plenty of excellent food, it’s also open 24 hours daily, they have a beer pong when you want to drink and have fun at the same time, and there’s live music as well. Indeed, what more can you ask for? Oh, a free Wifi would be great! If they could provide that to customers, people would no longer want to leave. #61 Scout Rallos cor. 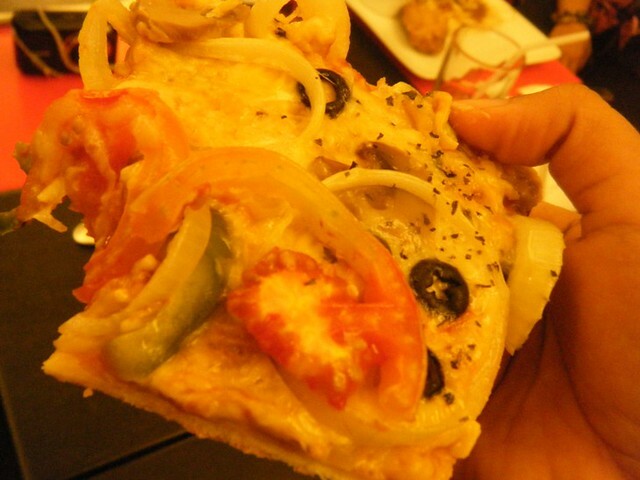 Tomas Morato St.
Wow thank is a huge pizza.. and i want to try that veggies pizza.. looking at that… feel ko masarap talaga siya. @ Jade: Yup, loved the veggie! Also the Margherita and the Special toppings. Good new resto. Their rosemary chicken is perfect! But I had the misfortune of ordering their flower vase iced tea. Geez, I almost drowned in it, but I still guzzled it till I felt like barfing it all out, hahaha! I wonder how big their tables are, I can’t imagine how they serve the 65-inch pizza. Btw, the El Buono special really looks like it could make you full with just one slice. whoa! ang laki ng pizza ha! ang cute din ni kuya. haha. char. ang cute ng mga glasses! omg sa 65 inch pizza. parang isang buong bansa na mapapakain nun ah! Wow they really deliver such a large pizza? Do they also have regular-sized ones? The pizza is good for a birthday celebration! Nyamyamnyam! pakisabi kay laura murayama, maging professional at maging taong kausap?#?!!!!!!!!!!!!!! !